All services and packages are by appointment only and can be reserved with your credit card or gift card. Thank you for your cooperation. This massage combines the therapeutic effects of heat and Swedish Massage. Heated river rocks are used by the therapist throughout the massage to warm and loosen tight muscles while melting tension away. It is very pampering, soothing, and relaxing! A complete sensory experience, this massage will calm your mind and soothe your tired body. Warm aromatic pack will ease away tension, while lavender essential oils are massaged into the skin for optimum absorption. This massage also includes lavender scrub infusion for feet. Perfect way to slow down after a hectic work week. Since ancient times, the Chinese have practiced foot reflexology to heal the body and mindmaintaining balance and equality.Thirty Minute Feet Treat ... Revive your tired feet with a stimulating dry buff, massage & reflex! Good for anyone on the go - feel energized & refreshed! Our own Peppermint Lavender Splash treatment tops this great treatment off! Is a form of deep tissue massage that is applied to individual muscles. It is used to increase blood flow, reduce pain and release pressure on nerves caused by injuries to muscles and other soft tissue. Neuromuscular massage helps release trigger points, intense knots of tense muscle can also “refer” pain to other parts of the body. Relieving a tense trigger point in your back, for example, could help ease pain in your shoulder or reduce headaches. Sports Massage blends deep Neuromuscular techniques with elements of Swedish and Japanese Acupressure to tailor the treatments to the client's individual needs and goals. Sports massage helps alleviate pain and prevent such injuries that greatly affect flexibility, mobility, response time, and overall performance in athletic events. An eclectic one hr. 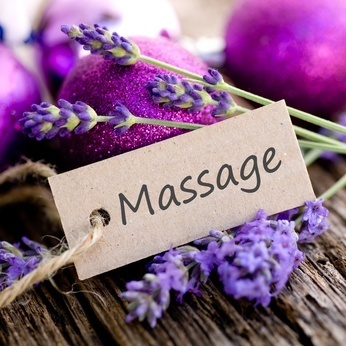 Signature Massage customized to your body's specific needs. We include a hot towel for your tired back and finish with moist hot towels for your feet. A luxurious choice of essential oils and various heat therapies such as, moist scented towels and warm flax seed pads will guarantee relaxation. Revive your tired feet with 15 min Reflexology Foot stimulating massage! Good for anyone - feel energized and refreshed! Our own Peppermint Lavender Splash treatment tops this great treatment off!